For children of AOL regular and cooperative members, we also offer additional scholarship opportunities. High school seniors and current college students who wish to pursue a business degree from a four-year college may apply for a $1,500 scholarship, renewable for up to four years, or $6,000. Children of AOL regular or cooperative members who wish to attend a community college or vocational school to pursue a career associated with the logging industry may apply for a scholarship that provides $750 per year for qualified candidates. A qualified career path will be determined by the AOL Scholarship Committee. An original essay, not to exceed three pages, covering the essay topic: "What challenges do you see in the field of logging and what are your views on meeting the challenges?" Candidate's studies and experiences as they relate to chosen field of interest. 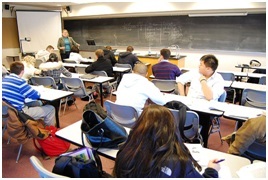 Scholastic performance in all classes as it relates to success in higher education (GPA). Thought process, grammatical usage and capability to express self in essay. Legibility, neatness, and accuracy of information submitted. The potential contribution of the student in the logging industry is the important issue. Financial need of the student is not a criteria for selection. The student does not have to be from a family whose interests and/or income is derived from a forest resource production related field. Selection is usually made by reviewing the items submitted. However, a finalist could be asked to be interviewed by the selection committee. All entries will be acknowledged. The actual financial award will be paid to the college or university. The winner will be invited as a special guest to the Annual Convention and asked to be a personal representative of the Associated Oregon Loggers Scholarship Competition.